Whether it's indoors or outdoors, wood that has been damaged by water and fungus must be repaired or replaced before it can be painted. Here's how to assess what's necessary and prepare the surface. 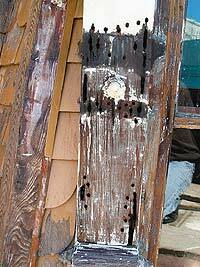 Whether it’s indoors or outdoors, wood that has been damaged by water and fungus must be repaired or replaced before it can be painted. Here’s how to assess what’s necessary and prepare the surface. What is dry rot, anyway? 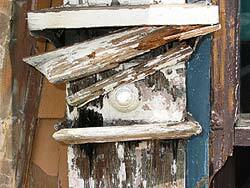 Despite its name, dry rot occurs only in the presence of moisture. Moist wood is an attractive habitat to several species of fungi. When the spores of these fungi fall on moist wood, they send filaments down into the wood to digest it, extend a cottony network of threads across the surface in search of new habitat, and finally produce a wrinkled, mushroom-like mass that generates billions of new spores. After the moisture has been eliminated and the fungus itself has been cleaned away, the underlying wood is cracked and porous, incapable of holding a fastener or supporting a coat of paint. Naturally, the first thing that needs to happen is that the moisture problem causing the dry rot must be corrected. This may be a job for a roofer, a plumber, or an HVAC specialist. 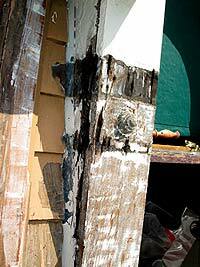 In general, dry-rotted wood that will be bearing a load should be torn out and replaced. However, non-bearing surfaces, such as window frames, trim and baseboards, can be repaired in place. Bob Behling works for Magic Brush in San Francisco, a painting company that specializes in restoring the Bay Area’s redwood Victorian houses. 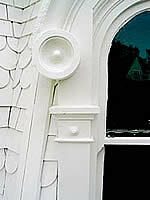 He says they often are called on to repair rather than replace because the elements in question are decorative shapes that can’t be replaced without costly custom millwork. Magic Brush happens to have team members with the skills to replace woodwork, but if you don’t, it may take a meeting between you, the owner, and a carpenter to establish whether it’s more cost-effective to repair or replace each element. After the source of rot has been eliminated and the area has thoroughly dried out, Behling says the first step in repairing a rotted area is to cut or dig out as much of the spongy, rotted wood as possible, undercutting the void so that the filler you apply will stay in. 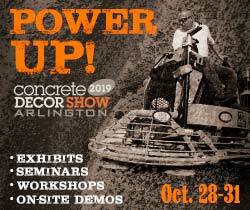 Then, you’ll need to treat the area with a “consolidant” or “wood hardener” that penetrates the wood, protects it from further rot, and forms a solid surface for the filler material to adhere to. 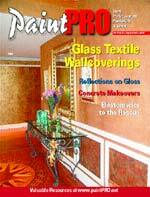 Magic Brush favors Smith & Co.’s Clear Penetrating Epoxy Sealer (CPES), a two-part epoxy liquid. Several similar products are available, such as Abatron LiquidWood. A one-component alternative is Minwax High Performance Wood Hardener. You can brush the liquid on, but to thoroughly saturate the wood around the void, Behling suggests using a 1⁄4" bit to drill a perimeter of shallow holes 1⁄2" to 3⁄4" from the margin of the void. “Don’t drill through the wood — just make a little cup,” he explains. “On a vertical surface, drill at an angle into the wood.” Then, fill a turkey baster or ketchup squirter with the epoxy liquid, which is as thin as water, and feed it into the holes until it stops soaking in. 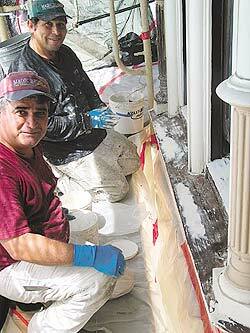 Smith’s product comes in versions formulated for cold-weather and warm-weather curing. You needn’t wait for a full cure before filling the void with wood filler; in fact, the wood filler will adhere better if the consolidant hasn’t fully cured. Fillers suitable for indoor and outdoor use include Minwax High Performance Wood Filler, Abatron WoodEpox, and Advanced Repair Technology’s Flex-Tec HV. These are two-part materials that must be kneaded with nitrile gloves until they are perfectly uniform. Then, you can push them into the void and into the holes you drilled, making sure that there’s no space behind them. In a large void, Behling first drives in hot-dipped galvanized nails to act as rebar for the filler. To minimize sanding, he smoothes the surface with a putty knife dipped in lacquer thinner. Although wood fillers are formulated to adhere well to wood and to expand and contract as wood does, other putties not specifically made for filling wood are suitable, such as Durham’s Rock Hard Water Putty. All these fillers can be filed, carved, or sanded to shape when they’ve cured, so you can recreate the contours of a molding or ornament. They will also hold a fastener. If the void or crack is large, says Behling, it’s best to cut a piece of wood to the approximate dimensions, embed it in filler, and nail it in, then fill the space around it with putty. This is because the surrounding wood will swell and shrink with changes in humidity. Over the years, a piece of wood will likely match the surrounding wood’s movement better than a big blob of filler will. Wood also costs a lot less than filler. Once the filled area has cured, sand it smooth, then prime it and paint it. Magic Brush always uses acrylic primers and paints, and they adhere just fine to the consolidant and filler, Behling reports. If the moisture problem has been thoroughly solved, your repair should last as long as the surrounding wood.